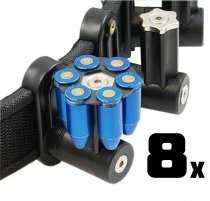 6 Shot .45 caliber moon clip holder. Rebate Funds Each product you purchase earns you a certain amount of Rebate Cash which you can use on your next purchase. This is called "Rebate Funds". Once you have accumulated some Rebate Funds you can choose to use it on your next purchase or keep saving it. To use your Rebate Funds make sure you tick the "Use Rebate" tick-box during the checkout process. Rebate Funds cannot be transferred to another user and have no expiration date. They are available to you for any future purchase on the DAA webshop. Moon Clips have been the main stay for revolver shooters for decades now! Even the concept of holding the moon clip magnetically is not a new one, but Double Alpha Academy has now taken it light years ahead with the new DAA Magnetic Moon Clip Holder! Custom designed from scratch and shaped specifically to fit between the rounds on a 6-shot .45 moon clip, providing increased surface contact area with the steel of moon-clip, for increased grip. The stem is contoured to match the cylinder shape of the bullets that are held in the moon clip. This design forces them into the same position, serving as an index and in turn improving the consistency of the retrieving process for reloading. The Moon-Clip can be angled to either side, providing a range of settings that are suited best for each individual need. The materials and construction ensures years of durable use. 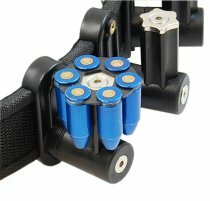 The DAA belt clip hanger, as used on the DAA Racer pouches, provides two height positions, and a secure solid attachment to a 1.5” belt. The slim steel plates of the belt hanger are of extra value for the revolver shooter, as so many moon clip holders are often used side by side. This slim designed ensures that the inner and outer belt stay well attached together. * The moon clip holders are shipped with 3mm thick magnets. 5mm magnets are available (optionally) for extra strong retention. These are useful in situations where moon clips made of steel that possess weak magnetic characteristics are being used.